Today is Friday and guess what? 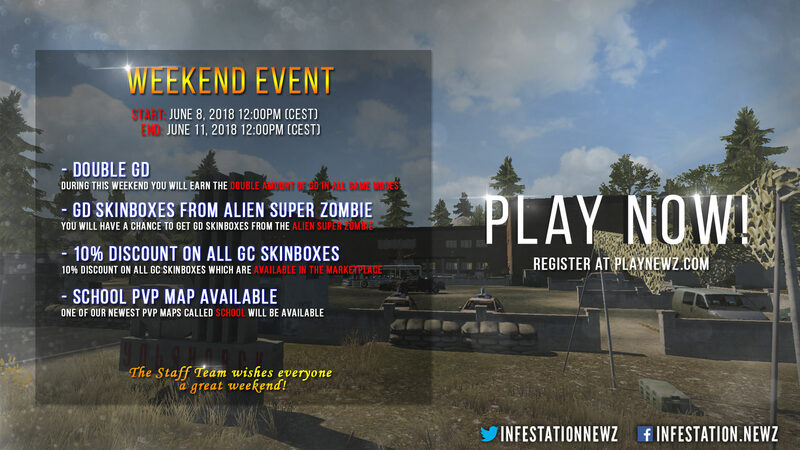 It's time for the weekend event! - Double GD (Game Dollars) on every game mode! - GD Skinboxes from Alien Super Zombies. - 10 % discount on all GC Skinboxes. - School PVP map available the entire weekend. The Staff Team wishes everyone a great weekend! ? Hey question here where can I find super alien zombies?? Cool event. May I ask does the double GD apply to my private server ? I have extreme membership does this mean I get 4x GD or 6X GD ? Can I get GD skinboxes from killing alien super zombies on my private server ? Thanks. Well don't know about everyone else, I sure enjoyed farming up some double GD this weekend! Thanks for the feedback! Glad you enjoyed it! Weekend event over. Thread closed.